There was a bee-hive on the roof of a house. One day, the master of the house of the house decided to disperse the bees. He thought that if the bee-hive would be destroyed, then the bees would fly automatically. 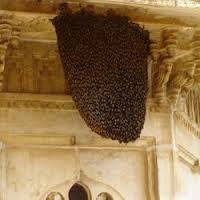 When his wife got to know about this, she opposed this and forbade him to destroy the bee-hive. The man gave up his plan to destroy the bee-hive. One day, the man went outside. Meanwhile his wife happened to pass near the bee-hive. Suddenly the bees attacked her. They stringed her furiously and made her ugly. When her husband returned, there was a hue and cry at home. His wife was in extreme pain and she was feeling restless. She was weeping and wailing continuously. The man saw him and said:''There is no use to cry. lf I would have destroyed the bee-hive then this would not happen. You were not aware that treating a noxious with kindness is like doing a turn with an oppressor. If a snake enters the house, it is not a sensible act to ignore him. Rather the noxious should be killed at once. A noxious cannot cause harm if it is killed at the right time. Similarly, an oppressor and autocrat can trouble poor people if he is ignored.